PAC-MAN, Galaga, SPACE INVADERS, EverWing, TRACK & FIELD 100M and Words with Friends: Frenzy…and many more titles rolling out, starting today. Messenger just got way more fun — or competitive — depending on how you look at it, with the ability to play games right in your messaging conversations. So when you’re looking for a reason to connect with your best friend who lives on the other side of the world, you can kick off a round of Words with Friends: Frenzy; or try again to beat your roommate at PAC-MAN just once; and of course, you always have time to challenge your brother to EverWing, SPACE INVADERS, TRACK & FIELD 100M, Galaga, and many other Instant Games. This gaming experience will first roll out to 30 countries, and is available for newer iOS and Android operating systems. We’ve made it very simple to start playing: In the latest version of the app, open a conversation with a friend (or friends! ), tap on the game controller icon just below where you type your message, and choose a game to start playing right away. After you finish a round, people in the conversation will see your score and will have the opportunity to challenge you back. People can also discover games within the Messenger search field, or on Facebook News Feed where they can play solo or challenge friends back in Messenger. 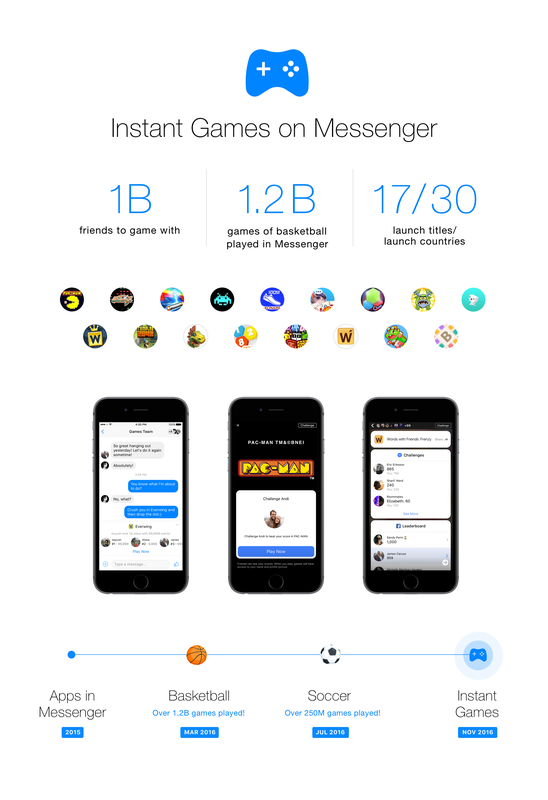 Games on Messenger are the first to be rolled out on Facebook’s new Instant Games cross-platform gaming experience. Social, fun and competitive, games on Messenger feature score-based leaderboards, in-context chat, and group thread conversations to challenge, celebrate and congratulate. The 1 billion people who use Messenger every month connect, banter and share in so many ways. They do this by sending Stickers when words aren’t enough, tapping on Instant Video to share smiles with Mom after an awesome day, or making a quick voice call to let friends know they’re running late. Now they can connect and compete over their favorite games. 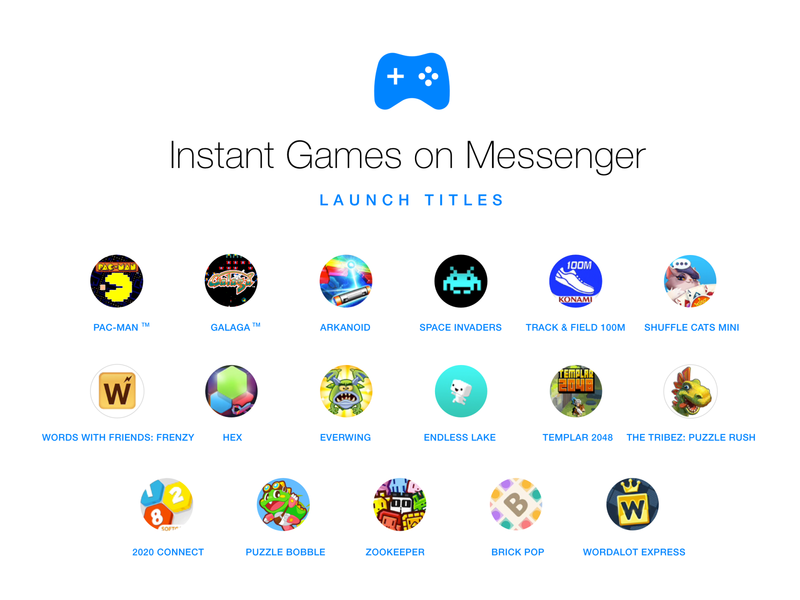 We think this is just the beginning for games on Messenger — look for new titles to be added, and for new ways to play. Game on!